Is Visiting Your Insurance Agency Website Like Going to the DMV? Does it make visitors want to pull up a chair and stay for a while? Or is finding useful information like to trying to figure out which line to stand in at the DMV? 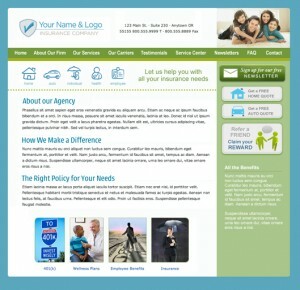 One of the ten biggest problems with insurance agency websites is poor design and functionality. Make it attractive and pleasing to look at and, just as important, make it easy to navigate. When visitors arrive at your site, show them how your site is organized, so they can find the things that interest them. Divide the material on your site into chunks: About Us, Our Services, Get a Quote, Service Center, Newsletters, Our Blog, Contact Us. Use titles like these for each section in your navigation bar, with pull-down menus that further define the content in each group. Make sure your website has a clean and consistent look throughout. Font styles, headers, graphic images, sidebars and footers should have the same look from page to page. Don’t crowd your page with lots of busy graphics and dense text that doesn’t align consistently on the page either. Let the pages breathe with plenty of white space. Limit your choice of font families to one or two, though contrast using a sans serif font for text and a bold serif typeface family for headers can heighten visual interest. These style choices will make reading your website easier, give it a more coherent appearance and present a more professional image. Simple layout and design choices will help people find their way around your page. The basic layout of a website is a header with a navigation bar under it, a sidebar to the left or right (or maybe both), the main content area in the middle and footer at the bottom of the page. The diagram on this page illustrates the basic architecture of most websites. The quality of your content must be compelling and appropriate for your target audience, but if the architecture of your website – the “living room” you’ve built for your Internet guests – isn’t inviting and comfortable, visitors won’t stick around very long.